Reports indicate that Apple is planning to release an Apple TV that supports high dynamic range. This emerged after movies listed on iTunes were shown to be supporting HDR and 4K in the purchase histories of users in the Canadian and United Kingdom stores. The implication was that Apple’s online store as well as devices are planning to support videos of higher quality in the near future. Currently the best quality video offered by iTunes is 1080p. If indeed Apple goes ahead to release an Apple TV that supports HDR, the streaming device might be a boost to the company’s stock since it will most likely drive video revenues on iTunes in a big way. It might also assist Apple TV in clawing back lost market share. Five years ago Apple TV’s share of the video streaming gadget market was 56%. But despite Apple TV becoming a business worth billions of dollars in 2013, it ended up falling behind other players such as Alphabet, Amazon and Roku. Apple TV was relaunched in 2015 and this came with an App store as well as an ability for playing video games and voice-controlled remote. 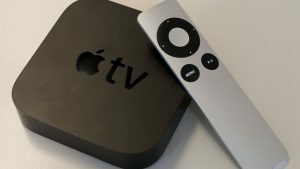 The device started at a price of $149 which made it pricier compared to the competition as well as the older Apple TV. To make matters worse, the device did not support 4K video when its competitors were already offering that. This did not help boost the adoption rate since 4K television was going mainstream. Video streaming services such as Netflix and Amazon Prime Video were also at the time increasing 4K video content. Though it didn’t provide specific numbers on how Apple TV has been faring, Apple recently admitted that sales of the streaming device fell in 2016. A study conducted earlier in the year revealed that in the United States, Apple TV was in 5% of the homes which had Wi-Fi while Roku and Amazon Fire TV enjoyed 18% and 21% market shares respectively. Due to the increasing stature and importance of streaming video, an Apple TV with 4K support is a highly significant development. This is because the market for streaming devices is expected to grow at a rate of 10% per annum for the next four years. But besides additional revenue which would be generated by increase sales of the device, an Apple TV device that supports 4K would boost video rentals and sales on iTunes.